This beach print is available as stretched canvas prints, acrylic, metal, framed, posters, phone cases, greeting cards and throw pillows. An impressionist paint of the ocean at dusk, a lone man strolling along the shore. A great Fathers' Day gift for a study, office or coastal decor. There are hundreds of beach and ocean paintings to browse. 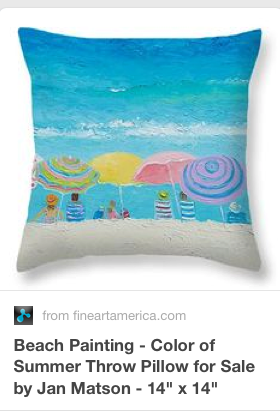 Fun and colorful beach art for coastal decorating, bathroom decor, or even kid's room decor. Available as stretched canvas prints, acrylic, metal, framed, posters, phone cases, greeting cards and throw pillows. Bright and cheerful beach paintings for coastal decor, bathroom decor, or even for kid's room decor. Available as stretched canvas prints, acrylic, metal, framed, posters, phone cases, greeting cards and throw pillows. Just click on an image and to the right you will see various types, prices and sizes. A cute baby koala for nursery decor, girl's room or boy's room decor. Check out many more quirky fun animals from my kid's decor gallery.